Pollution levels in Frankfurt regularly exceeded the limit. WIESBADEN, Germany -- Frankfurt must ban polluting, older diesel and gasoline vehicles from the city center starting next February as part of a plan to improve air quality, an administrative court ruled. The decision by the court in Wiesbaden on a case brought by environmental group Deutsche Umwelthilfe (DUH) came after a landmark ruling by Germany's top administrative court in February opened the door to inner-city bans. 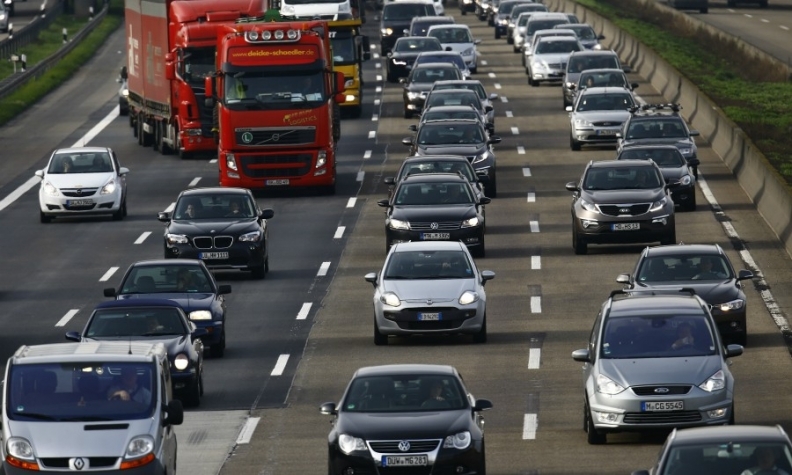 The ban would affect about a quarter of cars registered in Frankfurt and numerous commuters who live around the city. The court ruled that Frankfurt must ban from next February diesel cars that meet Euro 4 and older emission standards, and gasoline cars that meet Euro 1 and 2 standards, while Euro 5 diesels must be banned from next September. "The driving ban is necessary because all other measures considered by the state will not lead to a significant reduction of nitrogen dioxide emissions in an appropriate time," said presiding judge Rolf Hartmann. The court also ordered other measures to cut pollution in Frankfurt such as more electric buses, higher parking fees and more park-and-ride places on the outskirts of the city. DUH leader Juergen Resch said the decision would help accelerate the shift to electric cars and called on Chancellor Angela Merkel to force automakers to pay to retrofit diesel vehicles with exhaust-cleaning systems to avoid a ban. The regional government of Hessen also called for a speedy reaction from Berlin on retrofits, which the car industry has lobbied against because it could cost billions of euros. "We want a fundamental solution to this problem, rather than driving bans," state premier Volker Bouffier and Environment Minister Priska Hinz said in a joint statement. Merkel has said she will do everything possible to avoid driving bans but disagreements over how to tackle the problem of diesel cars with high nitrogen oxide (NOx) emissions have strained her coalition with the Social Democrats. DUH has argued that banning diesels is the only way for Frankfurt to meet European Union clean air rules which stipulate that NOx pollution should not exceed 40 micrograms per cubic meter of air on average. "We need to understand that this is about a threat to our health," Hartmann said in his opening remarks, adding that this was not merely a niche matter for environmentalists. Pollution levels have regularly exceeded the limit in Frankfurt since 2010, the court heard. The city of Hamburg this year voluntarily blocked diesel models that fail to meet the latest Euro 6 emissions standards from using selected trunk roads. Other cities including Aachen, Duesseldorf and Stuttgart, home to Daimler and Porsche, are also considering bans. The threat of bans on diesel vehicles has already led to higher sales of gasoline engine cars in Germany, which are less fuel efficient and cause more carbon dioxide pollution. This in turn makes it harder for automakers to cut emissions of greenhouse gases, increasing pressure on them to push electric or hybrid vehicles. The ruling comes a day after Mercedes-Benz unveiled its full-electric SUV, the EQC, marking the start of a German onslaught against Tesla's dominance of the fast-growing market for premium battery cars.